So apparently there is this new thing call “souping”. Have you heard of it? It’s similar to a juice cleanse, but instead of juicing, you get your pureed soup on for a week. Hello delicious. I’m not a fan of juice diets, but eating nutrient-dense, hearty pureed soups is totally something I could get behind. If souping really is a thing, then let me tell you – I am so freaking hip that I cannot even stand myself. Or is it on fleek? 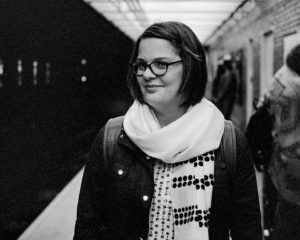 Regardless, I’ve been souping every winter for years, and trendy or not, that habit is here to stay. In all seriousness, I am a soup devotee, and pureed versions are my jam. I can, and have, consumed soup for breakfast, lunch and dinner and I regret nothing. 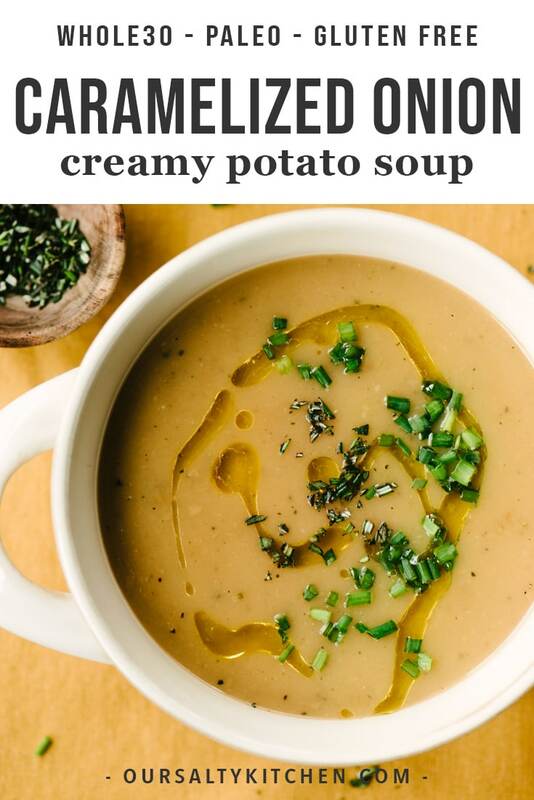 Soups are particularly attractive on a Whole30 and this nourishing, creamy without cream potato onion soup is no exception. The base of this delightful crock of foodie crack is caramelized onions. YAS. Caramelized onions are one of the easiest (and most economical) ways to add deep, complex flavor to just about any dish. 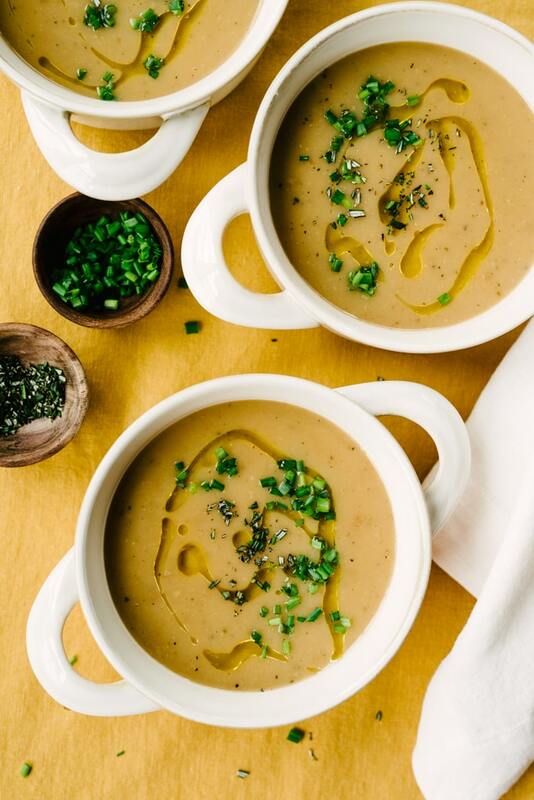 This recipe takes a bit of time, but your efforts are rewarded with a nutritious, wholesome, bone-warming soup that you can tuck into any time of day or night. 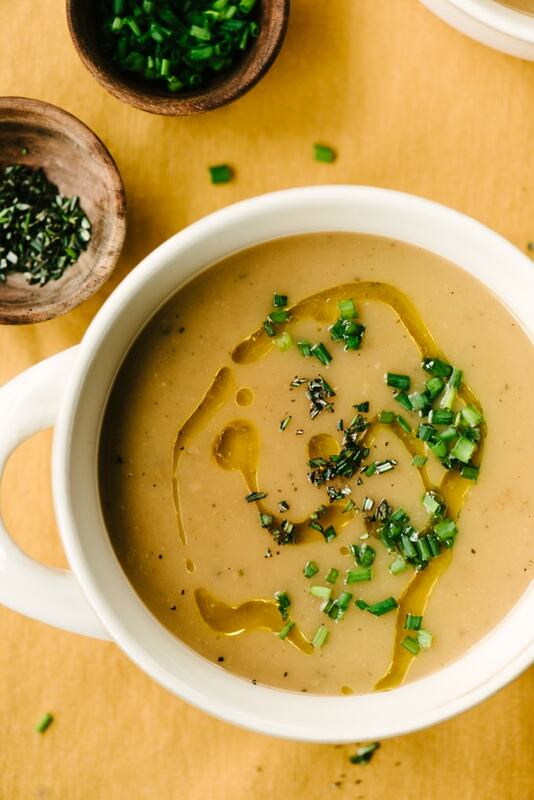 This potato and onion soup doubles easily, makes for a cozy packed lunch, freezes like a champ, and is all around friendly for people who like to eat tasty food – souping, Whole30-ing, and everything in-between. Are you experimenting with souping? I’d honestly love to hear about your experience. Share with me in the comments! Pin it now! 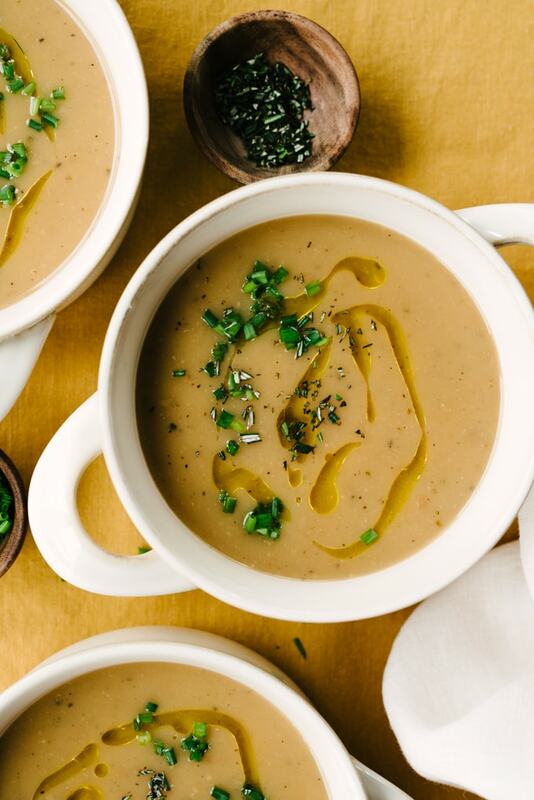 Click here to add this Potato Onion Soup Recipe to Your Pinterest Boards! 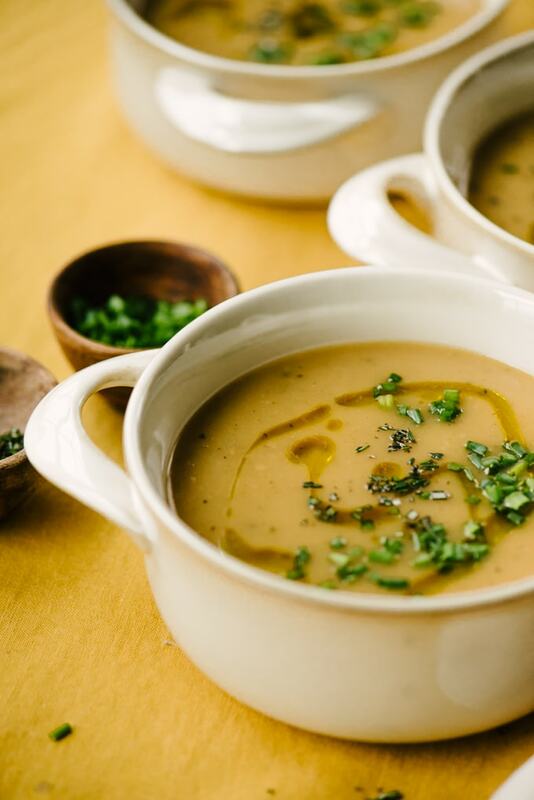 This potato onion soup recipe gets its sweet, complex flavor base from caramelized onions. Caramelizing onions takes a bit of time, and it would be unwise to rush the process. Burnt onions are bitter and strong, and we want sweet and complex. 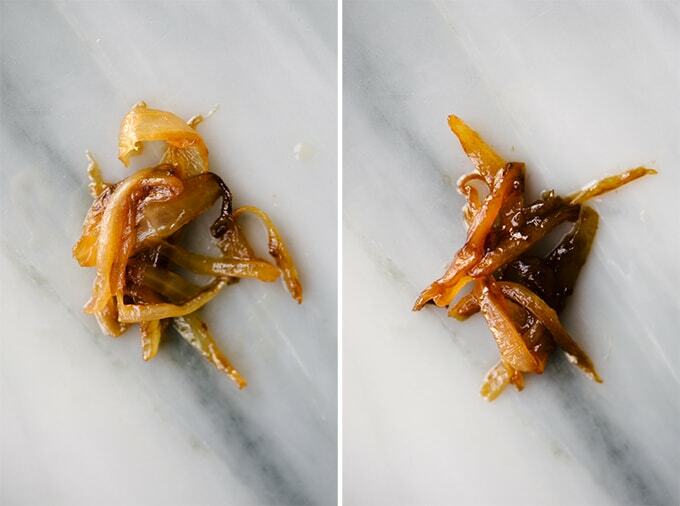 There are two keys to perfectly caramelized onions – time and moisture. You want to heat them over moderate heat, stirring frequently, and adding moisture to the pot as the onions cook down and lose their own moisture. Ready to become a caramelized onion pro? Let’s get started. 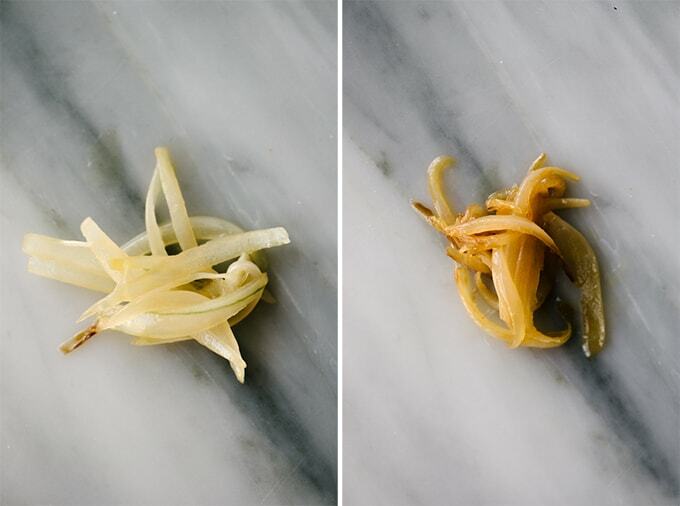 Grab a large vidalia onion, trim the ends and remove the peels, then slice it in half. Using a sharp knife or a mandoline, slice each half into thin, even pieces. You don’t want big chunks here, so aim for your slices to be 1/4″ thick or less. Heat a dutch oven over medium heat and add a couple tablespoons of ghee (for Whole30) or butter. Let the fat heat up, then add the onions along with a pinch of fat. Stir the onions to coat them in the fat, and then wait for the magic to happen. You want to give your onions a good stir every 5 minutes or so. If you notice them sticking to the bottom of the pan, or if the edges start to brown much faster than the interiors, add a bit of moisture to the pot. You can use water, broth, or even white wine. I add about a tablespoon at a time, and usually end up adding a quarter to a third-cup of liquid in total. Just keeping stirring and adding liquid until the onions go from translucent, to gold, to deeply brown and caramelized. It’ll take 30-40 minutes total, depending on the size of your slices, and the precise heat you’re cooking over. Here’s how my onions looked after 10 minutes (left) and 20 minutes (right). Here’s how they looked after 30 minutes (left) and when I took them off the burner at 34 minutes (right). Now the “hard” part’s over. You’ll add some aromatics to the onions (garlic, fresh rosemary), diced potatoes, and broth. I use bone broth, as I do for the vast majority of soups on this blog. Bone broth adds healthy fat, additional nutrients, and a velvety texture (thanks gelatin). If you’re making this vegetarian, use vegetable broth (preferably homemade). Simmer until the potatoes are soft, and then add a squeeze of fresh lemon. A touch of acidity really rounds out the flavors. Puree with a stick/immersion blender or your stand blender. If the soup is too thick, add a little more broth (I added about half a cup). I garnished my potato onion soup with a little bit of extra virgin olive oil, and its buttery, floral flavor is a really nice contrast to the creaminess of the soup. Chopped chives and a little more fresh rosemary (not too much) give each bite a bright finish. Looking for more pureed soups? Your wish is my pleasure. PIN IT NOW, MAKE IT LATER! Click here TO PIN THIS Whole30 Potato Soup Recipe. 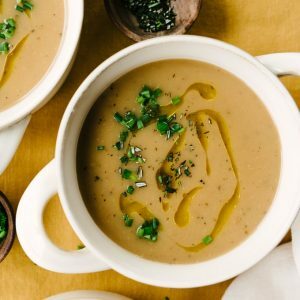 This potato onion soup is creamy without cream, slightly sweet from a base of caramelized onions, and as cozy as your favorite blanket. It's nutrient dense and bone warming, and naturally Whole30, paleo, gluten free and grain free. Trim the ends of the onion, remove the peel, and slice in half. 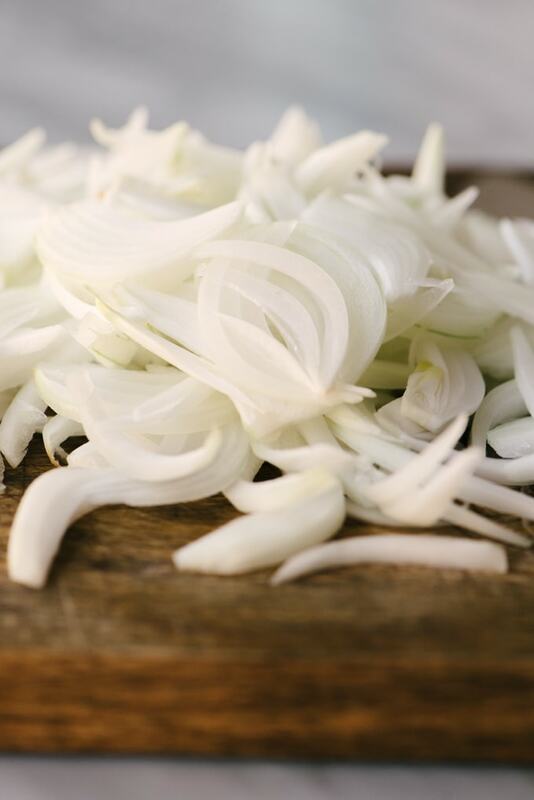 Lay the onion cut side down on your cutting board and thinly slice into ¼” slices using a sharp knife or madonline. Set aside. Heat a dutch oven over medium heat; add the ghee or butter and allow it to melt. Add the onions to the pot plus a pinch of salt, then stir to coat the onions in the fat. Saute the onions over medium heat, stirring every 5 minutes or so, until the onions soften, then brown, then caramelize. If the pot gets too dry and the onions start to burn and/or stick, add a bit of water or broth to deglaze the pan and keep the onions moist. I typically add up to ¼ cup of liquid during the caramelization process. Caramelization takes time, anywhere from 30-40 minutes. The onions are done when they are uniformly deep, golden brown. While the onions are caramelized, dice the potatoes and set aside. I leave the skins on, but you can peel if desired. Chop the garlic and herbs, and set aside separately. Add the chopped garlic to the onions and saute, stirring continuously, until the garlic is fragrant, about 1 minute. Add the potatoes, broth, salt, and a pepper and give everything a good stir. Top with the fresh rosemary sprig and bay leaf. Increase the heat to high and bring the liquid to a boil. Reduce to low and simmer until the potatoes are cooked through, 20 minutes. Fish out the rosemary sprig and bay leaf, then add the lemon juice. Using an immersion blender, blend the soup until its completely smooth. Taste for seasoning and add additional salt and pepper as needed. Ladle the soup into bowls. Drizzle with tbsp olive oil, tbsp chives, and ½ tsp minced rosemary. Serve immediately. This recipe serves four and lasts in the fridge for up to a week in a tightly sealed container. This looks positively glorious! What a great idea to pair caramelized onions with potatoes. I’d not heard of souping but I’d most definitely rather do that than juice! Much more satisfying. This recipe looks delicious! Potato soup is just so comforting and I always make in when someone in our house is feeling unwell. Onion and potato were just made to go together! Such a tasty looking soup – I love that you caramelized the onions to add that extra bit of flavour! Yum.